The cold mountain air is sure to whet your appetite. Krasnaya Polyana may be a small town, but visitors will find a variety of cafes and restaurants. Each establishment offers unique features including original interior design and specialties of the house. Savor real Russian borscht or enjoy a genuine French croissant. 1. Trikoni Tavern – this is one of the oldest cult establishments in Polyana. Skiers, snowboarders and especially free-riders congregate here when the forecast is for snow. The walls are decorated with vintage snowshoes and photographs from mountain expeditions. Snow camp parties mark the arrival of pro riders in Polyana, with live bands often playing in the evenings. The cuisine is traditional Russian and quite delicious – potato pancakes, hot borscht with sour cream and croutons, kholodets (meat in aspic) with horseradish and cake made with blinis to revitalize you after a long day on the slopes. Hours: 11 am to 11 pm. Non-smoking area. Payment by cash or credit card. 2. Le Chef – This French restaurant and patisserie offers a vast array of gastronomic delights and is a paradise for diners with a sweet tooth. In the patisserie visitors will find elaborate tortes and tarts created by dedicated pastry chefs as well as incredibly beautiful desserts, fresh French bread, and croissants made just right. The restaurant located just next door awaits lovers of fine French cuisine, and offers one of Sochi’s finest selections of French, Italian and Spanish wines for the perfect complement to your evening. Hours: 10 am to midnight. 3. Season is the best seafood restaurant in the Krasnaya Polyana region. Every week the chef receives deliveries of the freshest fish from around the world, shipped by air. Black Sea plaice grilled in crispy breading and crab cakes (or crab coulibiac) are especially popular with diners. Payment by cash or card. Smoking and non-smoking areas. 4. Patskha Achishkho is a perfect winter option, a cozy fireplace lounge where diners can get acquainted with the diversity of Caucasian cuisine. Georgian dishes such as chanakhi (a meat, vegetable and eggplant casserole) chakhokhbili (chicken with herbs), khinkali (meat filled dumplings) and satsivi (cold chicken with walnuts) are unique taste sensations. There are also a variety of entrees prepared on the grill or skewer. Meats are extremely juicy and smoke from the open flame endows vegetables with even more flavor. Hot Georgian lavash, a type of flat bread cooked in a tandoor oven or bread baked in a real Russian oven are a successful addition to the meal. For connoisseurs of alcoholic beverages, the restaurant’s cellars offer homemade wine and chacha, a Georgian distilled beverage similar to grappa. Visitors who prefer a non-alcoholic option can enjoy an aromatic tea brewed from local mountain herbs. 5. Wine House is a one of a kind restaurant that emphasizes preparing food and beverages from natural ingredients grown and harvested in the Krasnaya Polyana region. For Caucasian, European and local dishes, the restaurant prepares chicken and rabbit raised on its own dedicated farm. At the diner’s request, game can also be served. This, as well as other dishes including bread, pies and lepeshka (a type of Georgian bread) can be prepared right before the diner’s eyes in a tandoor or in an unusual, cupola-shaped oven. Diners can catch their own trout and sturgeon in a pond next to the restaurant and have them prepared. A variety of fruit drinks, such as kompot, mors and fruit liqueurs are made from berries and herbs hand-picked on the slopes of the Caucasus Mountains. Hours: 10 am to 11 pm. 6. Winter is a great place to warm up and have a quick, delicious snack after hours in the cold. 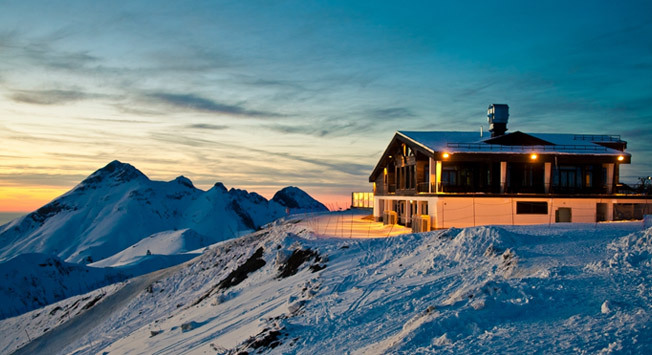 Located in the Rose Farm ski center at an altitude of 1150 meters, Winter is a large restaurant that can seat up to 1000 people. A buffet offers quick options including several types of soup, entrees, desserts, pastries and hot drinks. The restaurant can be reached by cable car with tickets available at the Rose Farm resort ticket office. The road leading to the restaurant will be closed to private vehicles during the Olympic Games. Payment by cash or credit card. Smoking and non-smoking areas. 7. 2200 is the highest restaurant in the south of Russia, with the name paying homage to the altitude above sea level. The view from this vantage point staggers the imagination. With two dining areas, visitors can choose between the cozy and family-friendly Casual dining room and the Fine dining room, decorated in a Stalin empire style and appropriate for business meetings or cocktail parties. For still another stunning experience visit the observation deck and chill-out zone. The restaurant is accessible only by cable car, with tickets available at the Mountain Carousel resort ticket office. 8. Aquarius specializes in unusual snacks and entrees including venison, wild boar, bear and quail, all served in exquisite sauces. Your waiter can recommend the alcoholic beverage that will complement your chosen entrée. Cash only. Smoking and non-smoking areas. 9. Valenki Café is a small and cozy restaurant perched at 960 meters above sea level and decorated in authentic Russian country style: an old-fashioned Russian stove, wicker fence, balalaika and sunflowers. It’s the perfect atmosphere to enjoy blini with honey and caviar and drink warm, aromatic tea. The restaurant operates in accordance with the cable car schedule. 10. The Varenniki Hut Cafe serves a delicious and nutritious traditional Slavic dish – varenniki, or dumplings. A thin slice of unleavened dough is stuffed with filling, folded into the shape of a crescent and dropped into boiling water for five minutes. Fillings can include chicken, mushrooms, potatoes, cheese or berries. Along with your main dish, you can enjoy a variety of fruit drinks or aromatic tea. Hours: 10 am to 10 pm.